But what to do when one needs to run for a bus, a train, or dart out of the rain, whilst wearing a pair of stilettos? Perhaps a spontaneous desire to bust a move overrides the ridiculous heel height, yet an attempt to do so, may result in a sprained ankle. That's when a pair of emergency sandals come in useful. It is not uncommon, to see a lady with a pair of rubber flip-flops in their purse, used when maybe a few beverages might otherwise end in injury from the fallen high heel wearer. Instead of trotting about bear-foot, the heels come off, and are replaced with their trusty rubber flats. However, rubber flip-flips are perhaps not the best shoe to hold in a purse, their cumbersome size and shape can be irritating. When SPAIR Sandals sent me a pair of sandals to review, I couldn't wait to see them. Not only are these flats collapsible, but every pair of SPAIR Sandals is made with recycled tires (tyres) and leatherette. How cool is that? 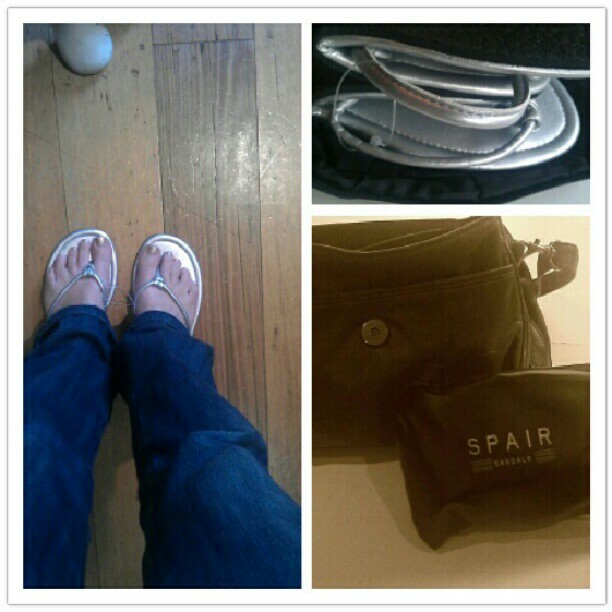 "SPAIR’s use of this valuable material literally transforms dangerous trash into stylish treasures by recycling the rubber of these discarded tires and creating the durable, comfortable, sole of SPAIR sandals." I'd like to congratulate the brand for their eco-friendly inventiveness, creating a compact sized shoe, which comes with its own little zip up carry case, meaning the rest of your handbag is left clean the next time you take them out. Are they comfortable? Whilst I've yet to walk far in my platinum sandals, as it is not yet the weather for them in this part of the world, I can confirm their comfort when worn around the house, and look forward to road testing during the silly season. These eco-friendly, foldable flip-flops are available in three colours, black, bronze and, as shown, platinum. They cost $24.95, which can be ordered online here. Do you take a pair of flat shoes out with you when wearing heels? Brilliant, I have packed spare flip flops before for a walk home after a night out or the end of a wedding!! I love the idea of glamour but it doesn't always last long with me !! Great idea, Erica! I tend to wear mostly low heels anyway, but for those days that require a "sit down" shoe, these would be grand. I call mine "stay put shoes" bahahaha and it's ALWAYS when I wear these out on a date that my boyfriend is like, "let's go for a walk..."